Bezalel Rugs and Carpets were produced in the early to mid-twentieth century as part of a new art school for Jewish immigrants in what was then British-ruled Palestine. 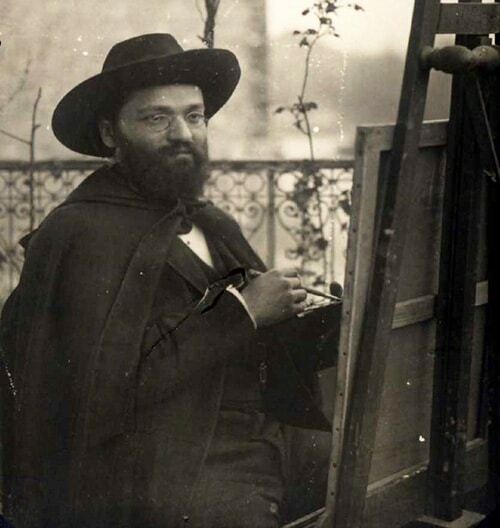 Founded by Boris Schatz from Bulgaria in conjunction with Zionist pioneer Theodore Herzl, the Jerusalem workshop and art school were established creative and supportive place for Jewish artists. These, now Israeli artists, were motivated to mesh their European artistic approached and traditions with their now more Oriental or middle eastern homeland. True to this inspiration, the Bezalel rug workshop drew upon a wide range of Oriental rug designs, while often exploring folk art traditions from the west as well, but always adhering to a high artistic and technical standard. 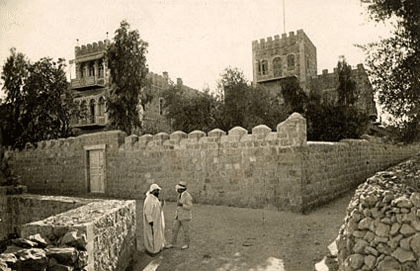 The Bezalel art school was established in 1906 by Latvian sculptor Boris Schatz in conjunction with the Zionist pioneer Theodor Herzl, and it is still in operation to this day. “Bezalel” was the biblical name of the “Artist” who designed the Ark and the sanctuary built by Israelites following the Israelites’ exodus from Egypt. The purpose of the Bezalel art school and workshop was to provide a unique educational institution, in what was then British-ruled Palestine, for those Jewish students who had recently immigrated to Palestine and wanted a means to express outstanding and distinctively Jewish art. The rug weaving program, though small in the number of participating art students, resulted in the creation of what many have come to see as some of the most beautiful and artistic rugs to have been created. Jewish artists do not normally come to mind when thinking of antique Oriental rugs, however that is exactly who made Bezalel rugs. These carpets were woven at the Bezalel Academy which operated from 1906 to 1929 in British-ruled Palestine. 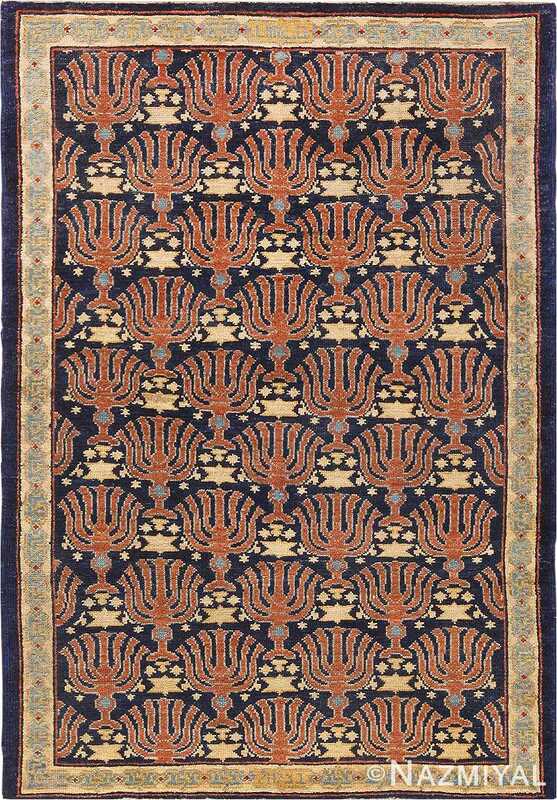 The Jewish arts-and-crafts movement inspired a wide range of unique rugs, often with religious themes. Bezalel rugs woven in Israel often have Holy Land themes and display a blend of Jewish, Persian, Turkish and European styles. 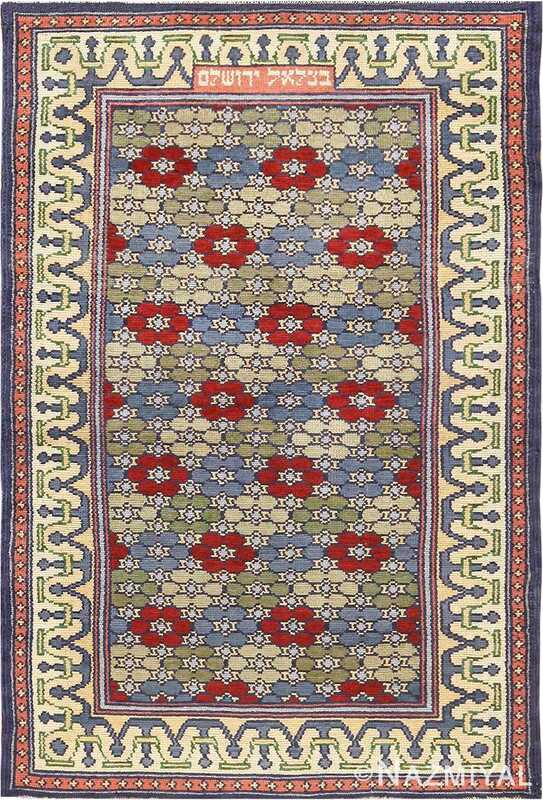 The construction and warm color pallet of Bezalel rugs resemble many Anatolian Rugs of the Ottoman Dynasty. The school encouraged Jewish artists to draw motivation from their European customs while including influences from their Oriental motherland to create quality pieces of art. The result was a large body of work including paintings, wood and metal works, etchings and carpets with a distinctly Jewish flair. 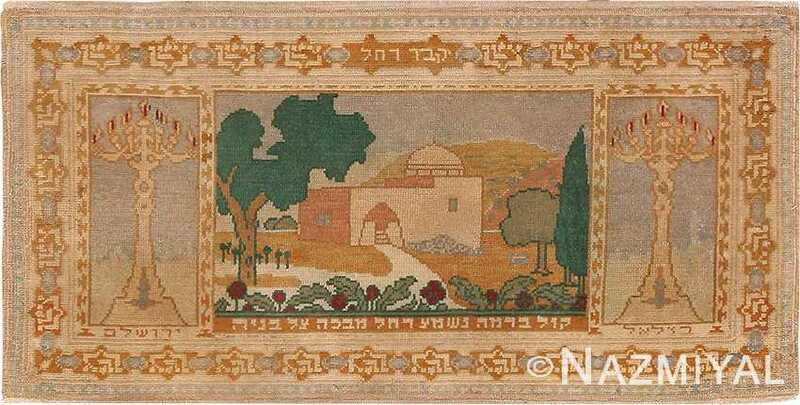 The carpets were created by Jewish artists at the school or its workshop in Jerusalem with high technical and artistic standards. The Bezalel rug workshop employed a variety of Oriental designs and often found inspiration in western folk art traditions. The rug weaving workshop was called Marbediah. 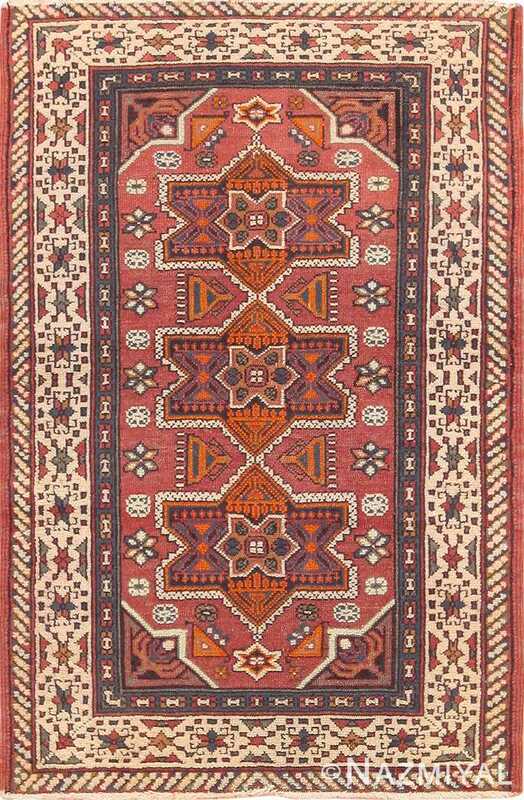 The name was derived from the Hebrew word “Marvard” which basically means “carpet”. These antique rugs are inscribed either Bezalel or Marvadiah. 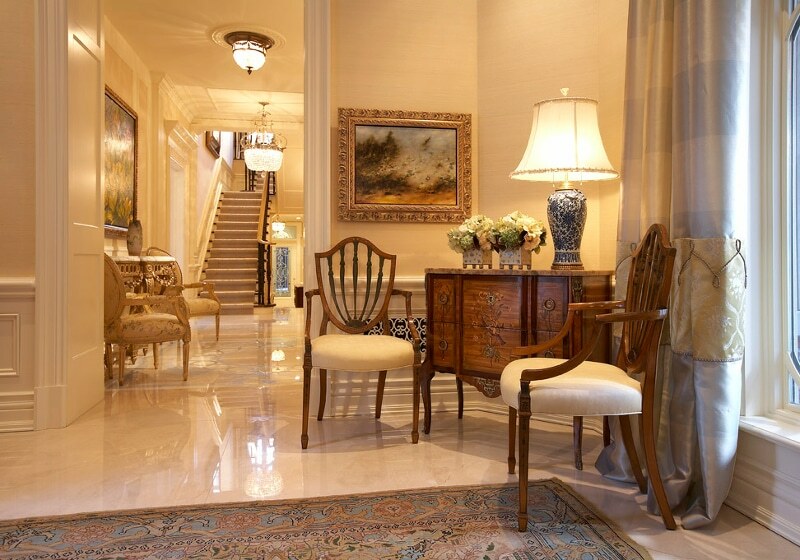 Bezalel carpets are among the most beautiful and sought after of all antique carpet styles. Bezalel carpets have been woven in modern-day Israel since the early years of the twentieth century, and the story behind what makes Bezalel rugs so special is fascinating – and even unique. Prior to the establishment of the modern state of Israel in 1948, the Palestinian Mandate was governed by the British Empire. It was here that the Bezalel Academy was established. The Bezalel Academy was founded as an art school for Jewish immigrants who were living in the Palestinian Mandate. The Academy and its workshop in Jerusalem were intended to provide an artistic outlet for Jewish artists, and to encourage them to fuse their European traditions with those of their Oriental homeland. As a result, the weavers at the Bezalel Academy would craft a new aesthetic, creating a brand new style of Oriental carpets in the process. 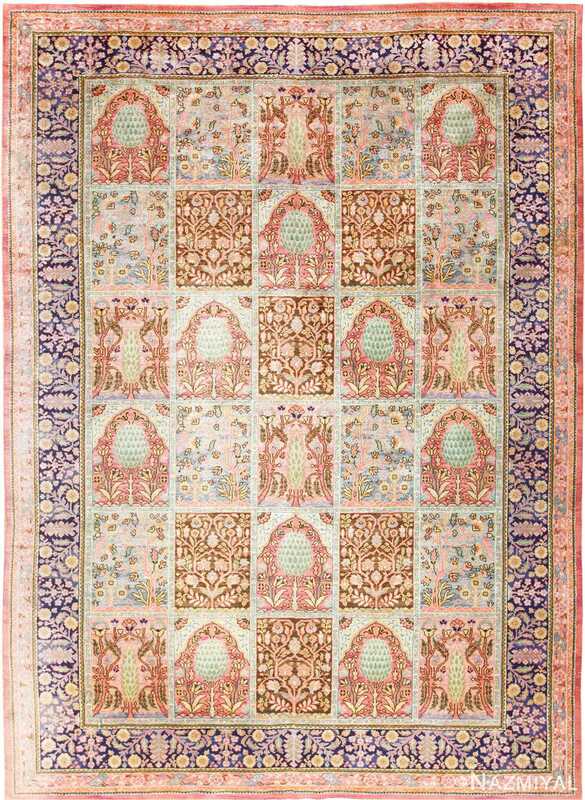 The Bezalel style, with its blending of tradition and modernity, remains among the most admired of all Oriental rug styles. And while there is no single rule that underpins the Bezalel style, there are certain qualities and characteristics that occur more frequently. For instance, Bezalel rugs woven in Israel will often feature religious elements, as well as artistic depictions of the Holy Land. This beautiful interior, designed by Lori Morris, beautifully utilizes a stunning Bezalel in a modern setting. Decorating with Bezalel rugs offers up an exciting array of opportunities, as well as a unique set of challenges. Perhaps the most accommodating aspect of the Bezalel style is its nature as both an Eastern and Western inspired style. Bezalel rugs from Israel offer collectors and admirers of antique Oriental rugs an opportunity to own something not only beautiful, but culturally significant. Decorating your home with antique Bezalel rugs is a unique experience, mostly because Bezalel rugs themselves are unique. 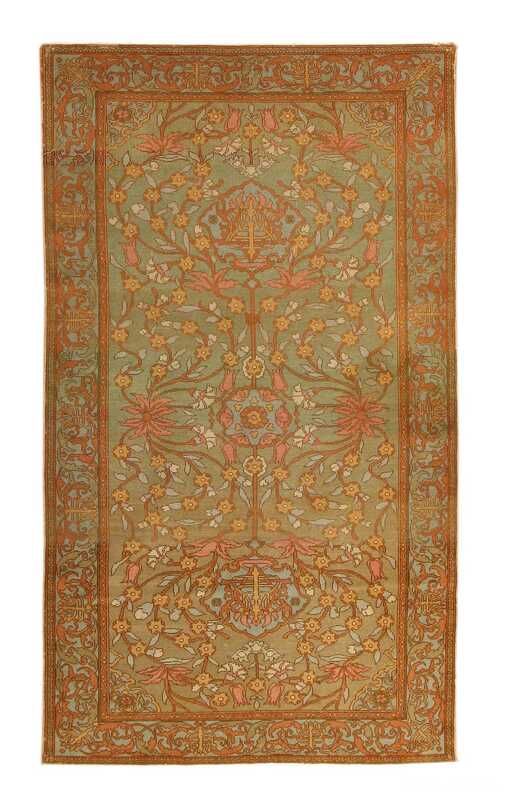 Indeed, the history of antique Bezalel rugs and carpets is among the most interesting of histories of fine rug styles. The story begins during the early years of the twentieth century, in what was, at that time, the Palestinian Mandate. The Mandate, which was governed as part of the British Empire, consisted of the territory that was destined to become the modern State of Israel. 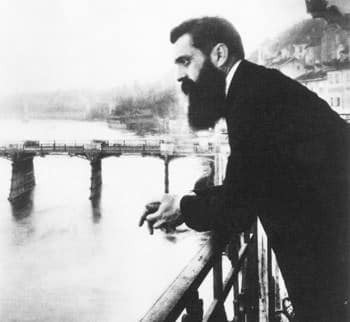 The two most important figures to feature in the story of the emergence of the Bezalel style of rug-making are Boris Schatz and Zionist pioneer Theodore Herzl, who founded the Bezalel Academy in Jerusalem. The academy was founded as an art school for Jewish immigrants living in the Palestinian Mandate: the academy and its workshop in Jerusalem were intended to provide an artistic outlet for Jewish artists, and to encourage them to fuse their European traditions with those of their Oriental homeland. The distinct Bezalel style of rug making that resulted from this fusion of cultures remains among the most beautiful and the most collectible of all Oriental rug styles. Bezalel rugs woven in Israel often feature religious elements, as well as artistic depictions of the Holy Land. 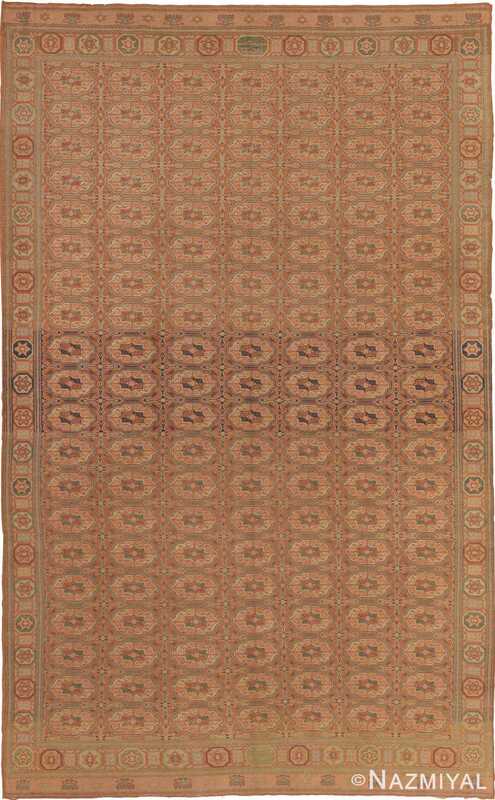 Because of their unique genesis, the antique Bezalel rugs are certainly among the most distinct and most interesting rugs available. Decorating with antique Bezalel rugs offers up an exciting array of opportunities, as well as a unique set of challenges. Perhaps the most accommodating aspect of the Bezalel style is its nature as both an Eastern and Western inspired style. This coming-together of what would otherwise potentially be disparate design elements creates what is instead a harmonious and versatile style that can bring unparalleled beauty into any home. 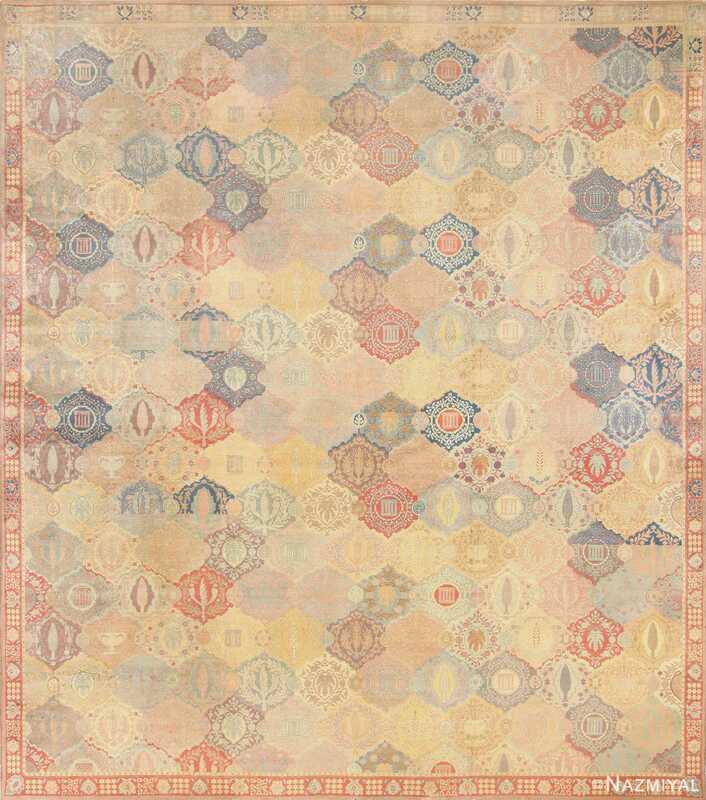 Featuring a clever and beautifully executed pattern of overlapping shapes, this Bezalel rug, rich with Judaica symbols, is an intriguing piece. Its soft pallet and monumental size underscores its uniqueness. 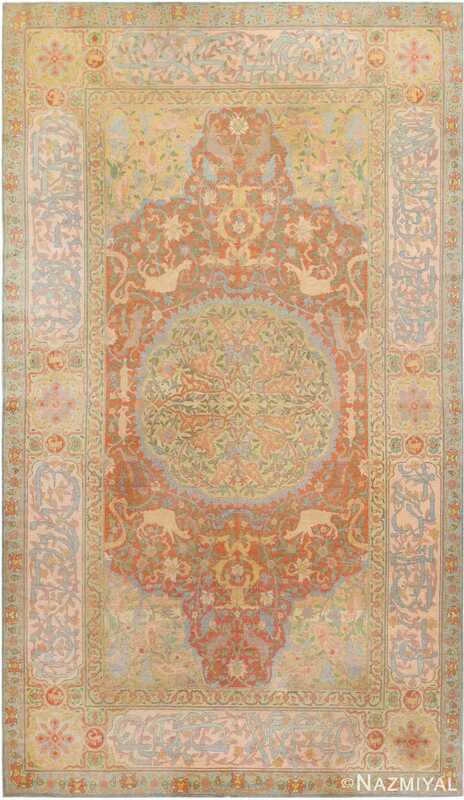 This antique Bezalel rug features a beautiful classical design, as well as intriguing depictions of animals, giving it a unique aesthetic appeal.